Daily Distractions: How a quirky, schedule-induced disabled list rule could affect the Dodgers’ Opening Day roster. How can a player go on the 15-day disabled list and miss only five regular-season games? If he plays for the Dodgers or Arizona Diamondbacks, of course. Thanks to a quirky schedule that has the Dodgers and Diamondbacks starting their season in Sydney, Australia on March 22 — a week before any other club — both teams will be allowed to place players on the disabled list retroactive to March 19. For every other team, the earliest a retroactive DL stint can begin is March 21. For Matt Kemp, who has pledged not to rush back from an off-season ankle surgery that’s still healing, it means he can start the season on the disabled list and be eligible to play in the Dodgers’ home opener April 4. The Dodgers play five regular-season games before April 4: The two games in Sydney, and a three-game series in San Diego. That’s good news for fans. The best news for the Dodgers might concern their starting rotation. In theory, only three starting pitchers are needed for the Dodgers’ first five games of the season. The two pitchers who start in Sydney (say, Clayton Kershaw and Zack Greinke) would have more than one week’s rest before the first two games of the San Diego series, March 30 and April 1. The third starter could pitch April 2 against the Padres. Then the rotation can reset on regular rest — if manager Don Mattingly chooses — with Kershaw and Greinke starting the first two games of the opening homestand April 4 and 5. If every pitcher stays on regular rest, the Dodgers won’t need a fourth starter until April 6 at the earliest. By then, the 15-day DL window will have expired. Let’s say the fourth starter is Dan Haren. Maybe Haren comes down with a nasty hangnail, a twinge in his pitching triceps, a strained SCL (something collateral ligament). He can start the season on the 15-day disabled list and the Dodgers can give that roster spot to an extra bench player or an extra reliever — maybe a swingman like Paul Maholm who could start in case of an unexpected injury (brawl?) involving one of the top three starters. 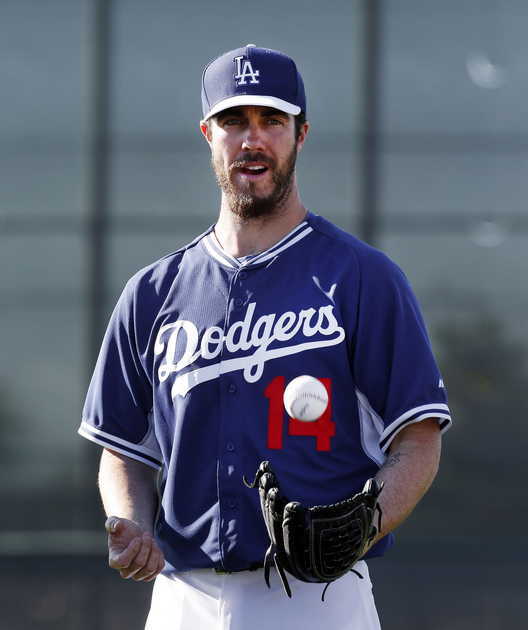 Haren can come off the 15-day and start on schedule April 6. It’s something to keep in mind when the Dodgers decide who’s playing in Sydney. More than a typical year, the disabled list could go a long way toward determining the Opening Day roster. Daily Distractions: How relationships made a difference for Skip Schumaker, Dan Haren. Skip Schumaker had never been a free agent before this year, and he wasn’t a free agent for long. Less than a month after the World Series ended, Schumaker signed a two-year contract with the Cincinnati Reds. “I didn’t really want to wait because I felt so good about Cincinnati,” he said on a conference call Tuesday. The idea of waiting in traffic on the way to Dodger Stadium didn’t appeal to Schumaker, either. His carpool buddy, Nick Punto, had just signed with the Oakland A’s on Nov. 13. That mattered. Dan Haren had been a free agent before. This time, the pitcher had help from Zack Greinke, his teammate with the Angels late in the 2012 season. This principle is nothing new, but it was interesting to see it work both for and against the Dodgers in the span of two days. Schumaker’s contract with the Cincinnati Reds was widely reported last week and became official Tuesday. Mark Sheldon of MLB.com reported that Schumaker will make $2 million in 2014, $2.5 million in 2015 and there is a $2.5 million club option for 2016 with a $500,000 buyout. Apparently the Dodgers weren’t that interested in bringing him back. With Ramirez returning, too little too late for Cruz to remain with Dodgers? Luis Cruz and Don Mattingly were using the same term, but referencing entirely different things. In every sense of the word, the Dodgers infielder’s timing was right on Tuesday. With his days on the parent club’s roster seemingly numbered as Hanley Ramirez works his way back from a hamstring injury, Cruz produced his first extra-base hit of the season when he needed it most. The timing of the 29-year-old’s two-run home run in the fifth inning of Tuesday’s 3-0 win over the Angels couldn’t have been better, according to Mattingly. The Dodgers manager was grateful it gave his team a lead it wouldn’t relinquish. Cruz was happy the timing of his plant foot and his swing were properly coordinated, something that has been plaguing him during a season-long slump during which his batting average has ranged from .087 to .115. Hanley Ramirez runs bases, could return to Dodgers next week. Hanley Ramirez ran the bases at Dodger Stadium for the first time since straining his left hamstring on May 3 and is close to going out on a rehabilitation assignment. “As we get through Anaheim, we’re talking about him playing some games the next few days,” Mattingly said. Ramirez wrote on his Instagram account last week that he would be “coming soon” to Single-A Rancho Cucamonga. The rehab process has been a frustrating one for Ramirez, who was only able to play four games after recovering enough from a torn ligament in his right thumb before suffering the hamstring injury. Ramirez said last week that he will announce his assignment in some capacity on Twitter. Assuming he plays Friday, Saturday and Sunday, it’s conceivable that Ramirez could be in a Dodger uniform next week when the team play a 10-game home stand against San Diego, Atlanta and Arizona. Nick Punto is starting at shortstop Monday against the Angels following the demotion of Dee Gordon to Triple-A Albuquerque. Punto and Luis Cruz figure to get the lion’s share of the innings at shortstop until Ramirez returns. Dodgers option Dee Gordon to Triple-A Albuquerque, activate Jerry Hairston Jr. from disabled list. The Dodgers activated utility player Jerry Hairston Jr. from the disabled list Monday afternoon as expected. He’ll be in the starting lineup against the Angels, batting seventh and playing left field. To make room for Hairston on the active roster, the Dodgers optioned shortstop Dee Gordon to Triple-A Albuquerque.